Business Hours, and After Hours. The steps below will guide Account Administrators on how to set up the Company Greeting via the Auto-Receptionist. 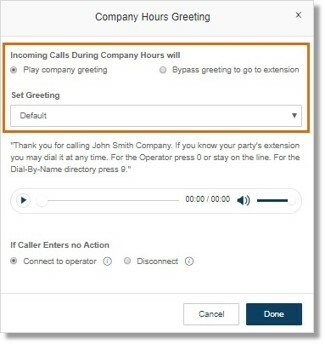 The Company Greeting and Menu section provides additional call handling options, including hearing the Default greeting and recording a Custom greeting. This is a great way to specify the greeting callers will hear when they call your main company number, during Company or Business Hours, and After Hours. QUICK TIP: The Company Greeting can also be set up through the AT&T Office@Hand Mobile app. 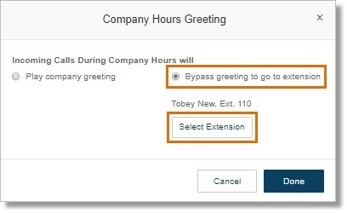 On either Company Hours Greeting or After Hours Greeting, click Edit. Select either Play company greeting or Bypass greeting to go to extension. – Custom Greeting – will allow you to set your greeting by Phone, Computer Microphone, or by Importing from your computer. To set the custom greeting, click the red Record button. 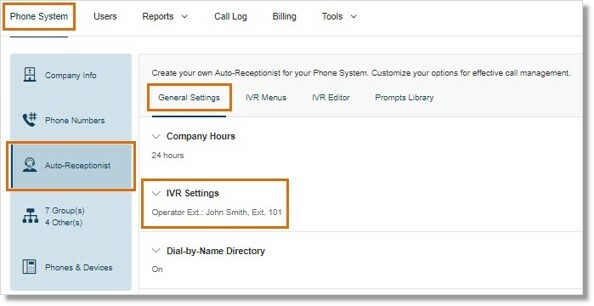 Under If Caller Enters no Action, select Connect to Operator or Disconnect. Click Done when finished. Connect to Operator – This is selected by Default. Selecting this option will direct callers to ext. 0, or the Operator Extension, after the greeting. See Call Handling – Set up Company Call Handling and Operator Extension | Admin | AT&T Office@Hand for more information. Disconnect – Selecting this option will disconnect the caller after the greeting repeats three (3) times.